Established in 1935 by President Franklin D. Roosevelt, the Social Security Act has provided a safety net for U.S. seniors, survivors, individuals with disabilities and their families. Nearly 60 million people receive some form of Social Security aid, costing taxpayers $73 billion more than was received in payroll tax revenue. As the number of retires increases the need for an accurate understanding of this 80 year old program is evident. 1. If changes are not made the Congressional Budget Office (CBO) estimates Social Security reserves will be depleted in 15 years. 2. 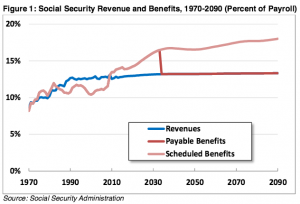 Without any changes, when reserves are depleted the revenue from Social Security taxes would be sufficient to pay only 73% to 79% of scheduled benefits. These cuts would apply to all Social Security beneficiaries both current and future. 3. If the $2.8 trillion of trust fund assets “raided” by Federal Government in the 1990s and 2000s was repaid, another $10.7 trillion would still be needed to make the program solvent. 4. While Social Security is excluded from on-budget calculations, since 2010 its continued drain on the unified budget will require the federal government to borrow more, cut spending or raise taxes in order to meet the program′s deficit. 5. Legally Social Security can and has run a deficit, spending more than it takes in during a single year. In 2014 Social Security had a cash-flow deficit of $73 billion. 6. Putting off Social Security reform is unwise as it will simply require larger and more abrupt changes later. 8. Reform is possible. Combined, the Social Security Chief Actuary and the CBO have published over 161 options and variations of solutions for Social Security reform.